but the pluses outweigh the minuses. The modern 1911 incorporates many of the same features that more modern DA pistols have. These include such things as accessory rails, high-tech finishes and polymer frames. In the second century of its existence, the 1911 pistol is enjoying a level of popularity unlike any time in its long history. The reasons for this are legion, not just that it is chambered for the powerful .45 ACP cartridge, as many believe. The truth is, the 21st century 1911 pistol is available in a number of calibers, including .45, .40 S&W and 9mm. 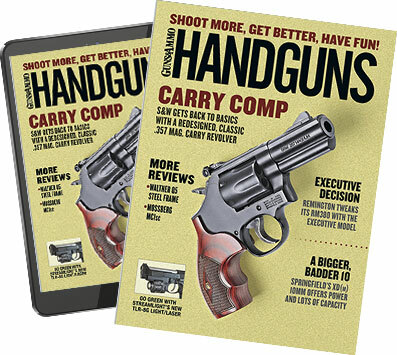 Regardless of what you may have heard, all of these loads are still popular in police circles, and all are available in a variety of 1911 frame sizes and styles, including several that fit snugly in the palm of an adult-size hand. 1911-style pistols can be purchased with a solid all-steel frame that makes them quite pleasant to shoot even with the most powerful loads or space-age featherweights that incorporate space-age alloys and polymers. The gun can be purchased in the traditional single-stack configuration or as a fat-gripped double column that can offer as many as 14 rounds in the magazine. Small, large, light, heavy, fixed sights, target sights, blue or stainless steel, slim line or high capacity--even "plastic" models--the 1911 offers many of the same features and advancements found in the new generation of double-action pistols. With all that the 1911 has going for it, one would think it would be more popular with American law enforcement officers. I believe the answer to this is the misunderstanding of the cocked hammer that is a required part of the single-action design. For the 1911 to be carried in a "fighting ready" configuration, it must be kept cocked and locked--with the hammer back and the thumb safety engaged. The average observer sees this gun cocked and in the holster, and since many citizens gain their limited firearms knowledge from television, they see this as a gun on a "hair trigger" and ready to go off. They simply do not understand what is really required to shoot the gun, and the thought of officers carrying a cocked gun is just too much for many American law enforcement chiefs and sheriffs as well. Some of these people are more knowledgeable about administration than they are about guns. They, too, see the gun just a breath away from going off, and since these administrators are greatly concerned about public perception, there is just no way they are going to let their officers carry a cocked gun. But those who take this view don't understand the design of the gun or what is required to fire it. In order to drop the hammer of a cocked 1911, three things must occur. First, the grip safety must be depressed. Second, the thumb safety must be disengaged. Finally, the trigger must be pulled to the rear. While it is true all of these actions can be accomplished in quick succession, each is an individual action that must be completed before the weapon will discharge. Just because the gun is cocked does not mean that it is an accident waiting to happen. An argument can actually be made that 1911 is in reality "safer" than some of the pistols that are currently popular in law enforcement circles. There are several striker-fired designs--exceptional guns whose popularity is well deserved--that require less effort and hand manipulation to shoot than does the 1911. Most 1911 pistols intended for defense will have a trigger weight of four to five pounds, which is a reasonable weight and easy to manage, even for the person with the smallest of hands. Some striker-fired guns require a pressure of five to eight pounds to fire with no additional manipulation beyond a safety lever that is part of the trigger. Several of the striker-fired designs can be modified so that a trigger weight of 10 to 12 pounds is required to shoot them, but these triggers are so spongy that the ability to shoot them quickly and accurately is greatly affected. Many police officers get minimal training every year and never do learn to shoot them well. Some will also say that the 1911 design is not as reliable as others. It has been my experience that when a 1911 becomes unreliable, it can normally be traced back to lack of maintenance or a gun that has been "customized"--and not by a professional, competent gunsmith. Now, before you start writing angry letters, this is not an indictment of striker-fired guns. I carry one of them myself, and I am very happy with it. All I'm trying to do is give the 1911 a pat on the back for having to "suffer" from a cocked hammer. As I see it, the best feature of the 1911 design is its sliding trigger, which I believe is far more ergonomic than the pivoting trigger that is used on every other pistol design. Without a cocked hammer, this sliding trigger would be impossible to incorporate into the gun's design. Competition shooters have understood this advantage for a long, long time. If speed and accuracy are the goals, the 1911's short-travel trigger system is the one to have. Shooting a handgun is a difficult motor skill, as it requires the hand to perform a task that it does not normally do: separate the index finger from all of the rest. Pick up a handgun and try to press the trigger without moving your other fingers. It's hard. And if your other fingers move, the muzzle is going to be taken out of alignment with the target, and at 15 feet, an eighth of an inch of muzzle movement translates to 41⁄2 inches--and twice that at 30 feet, enough to miss a vital area. It doesn't matter if you prefer point shooting or sighted fire, trigger control is a must. The sliding trigger of the 1911 is simply easier to master. As a matter of fact, if you take a close look at how the human hand open and closes and look at the controls of the 1911, you will see that John Browning was brilliant in understanding how the human hand functions when it shoots a pistol. Thinking about it in this way, a solid argument can be made that the 1911 pistol could increase the accuracy potential of the American law enforcement officer. Of course, a solid training program is necessary for the proper adoption and mastery of any weapon. It is a matter of commitment for both the agency and the individual officer. Should the 1911 be as common as any of the more popular pistols seen in cop holsters? You bet! It is just a matter of administrators and trainers taking a close look at it and understanding what the gun really represents. It is a "safe," accurate and easy to use system that has 100 years of proven street and battlefield history behind it. How many other pistol designs can say that?